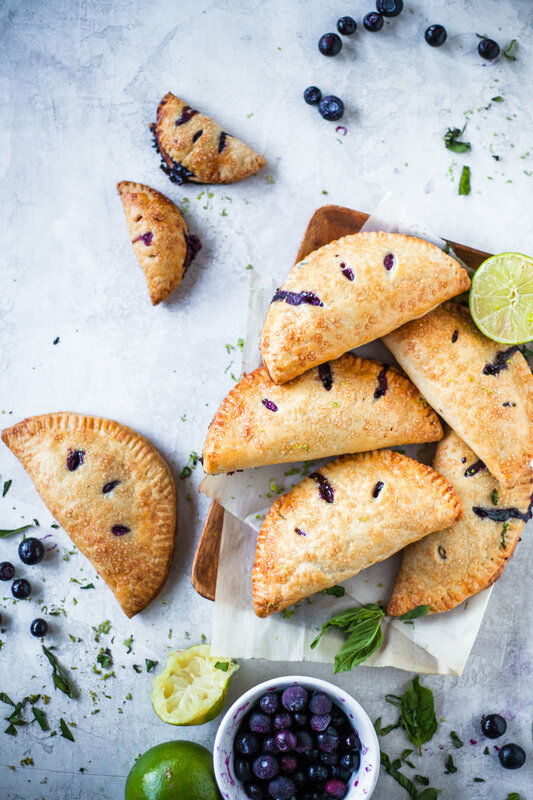 blueberry lime basil hand pies. a pie in the hand is worth two in the bellay. 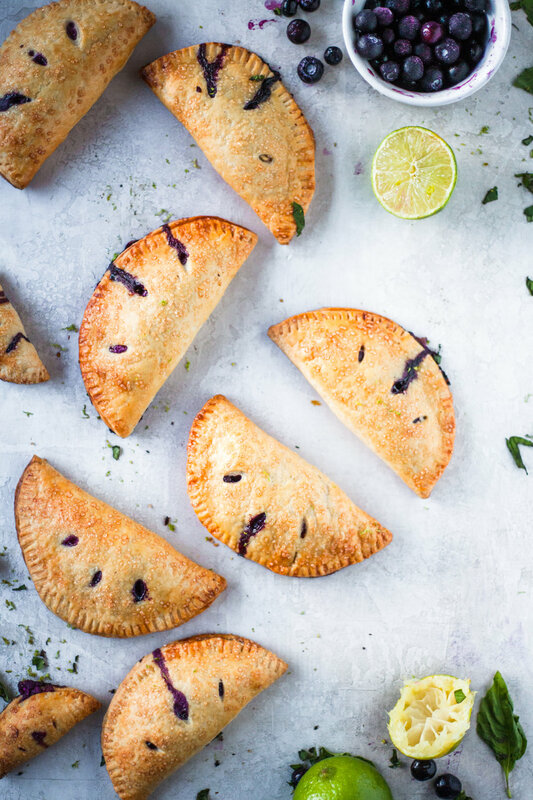 jeeeez how cute are hand pies though? now that i’ve made these, my head is spinning with all the possibilities. i want to shove nutella in there with something so badly. 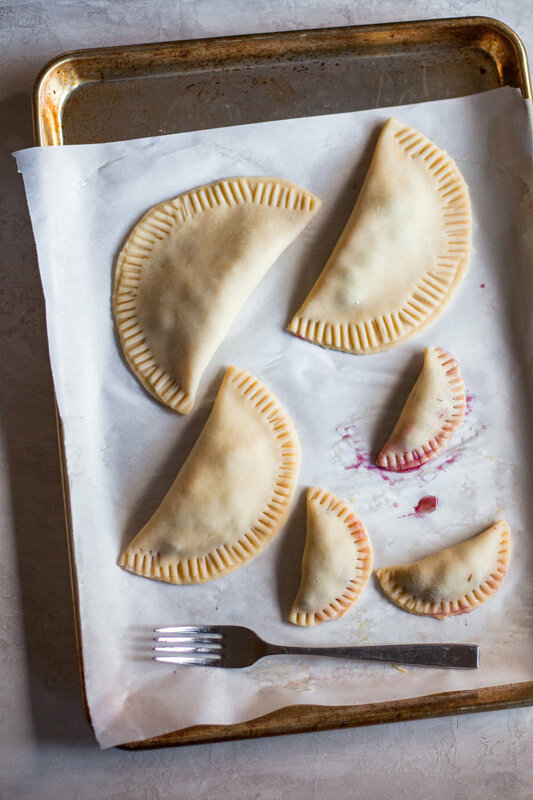 these are a bit of a project, but you can totally use pre-made/pre-rolled pie dough and then this becomes super super duper easy. i used alison roman’s “the only piecrust” again for this recipe - same that i used in the apple cheddar broccolini galette. it’s my only piecrust recipe now. it’s just perfection. 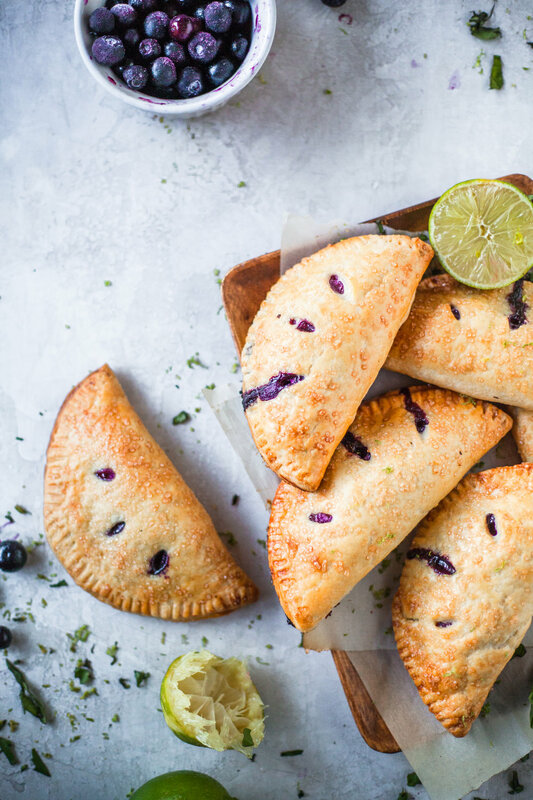 these hand pies were inspired by a plum hand pie recipe i saw in the beautiful pcc cooking from scratch cookbook. pcc is a community grocery store throughout seattle and the northwest, and the cookbook is just stunning! also inspired by the blueberry bourbon basil doughnut from blue star doughnuts in portland. have you seen it? have you had it? it is not only the most gorgeous color, but so soft & delicious. 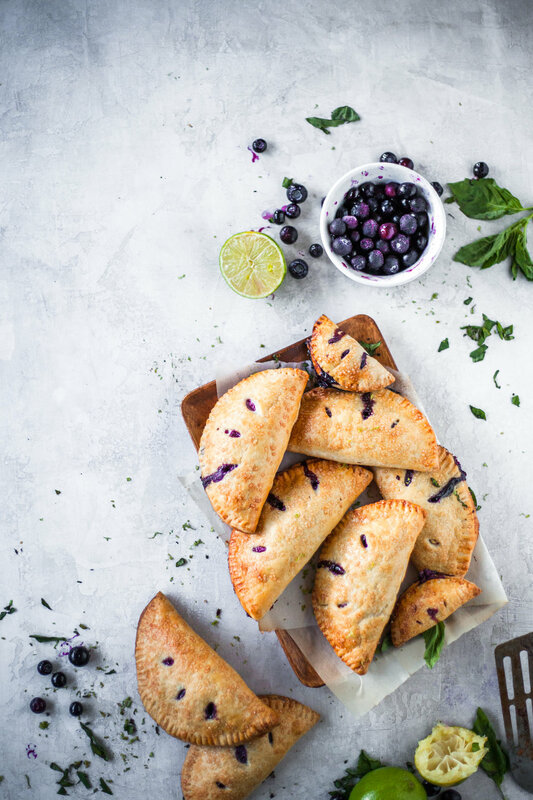 with all the inspirational powers combined, these cute little tasty hand pies were created. the flavors are so so good and fresh, and they have such a great texture! don’t forget the raw sugar or coarse sugar sprinkled on top! if you make these, you should try to fit as much fruit in there as possible. i tried to add just enough to not have the pies exploding blue juices out everywhere. 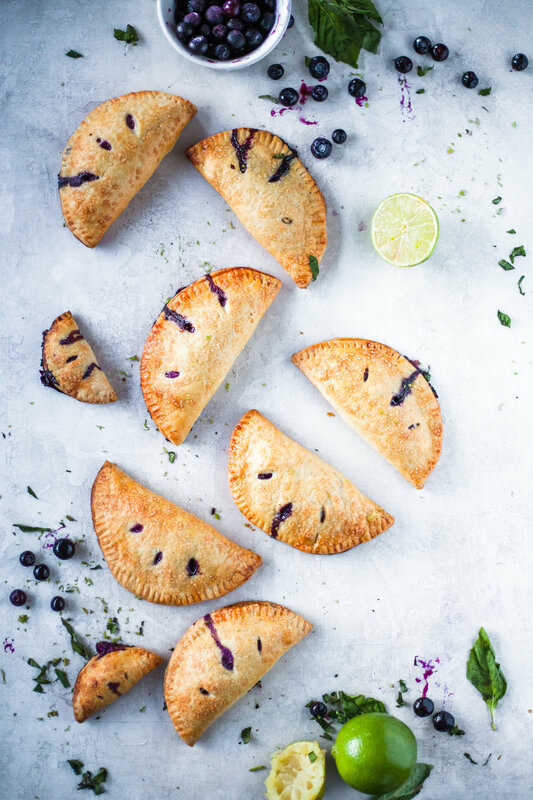 when they bake, a little pocket of air forms, leaving you wishing there were more blueberries inside. oh, science. you can totally enjoy them cold, too. they remind me of these mini apple pies some kid’s dad would bring into my first grade class and we’d always eat them cold, and they were amazing. these particular pies are made with goat cheese, but if you don’t like the flavor of goat cheese, i think another soft mellow cheese or ricotta or even some cream cheese would work just as well! i’m off to make allllllll the pie combos now. actually i’m off to make this freakin amazing looking cookie recipe from bon appétit….snickerdoodle party cookies with cornflakes & chocolate toffee barz… whoa. need. You can make the pie dough way in advance and keep in the freezer. Or make 1-4 days in advance and store flat rounds in plastic wrap in the fridge until you’re ready to bake. OR just use store bought pie dough! In a large bowl, combine the flour, sugar & salt. Add the chilled butter cubes and toss to coat in the flour mixture, then use your hands to smash the butter between your fingers. Incorporate the butter into the flour mixture until it appears shaggy and flaky. Combine the vinegar and the ice water and drizzle it over the flour + butter mixture. Run your fingers through the mixture to evenly distribute the water through the flour until the dough starts coming together. On a lightly floured work surface, knead the combined dough a few times to gather up and incorporate any dry bits. It will not be smooth or shiny. Knead the shaggy mass with your palms a few more times, then pat into a flat disk about 1 inch thick. Wrap the disk with plastic wrap and refrigerate at least 2 hours. In a bowl, combine the blueberries, brown sugar, cornstarch, lime juice and lime zest. Toss everything to coat. 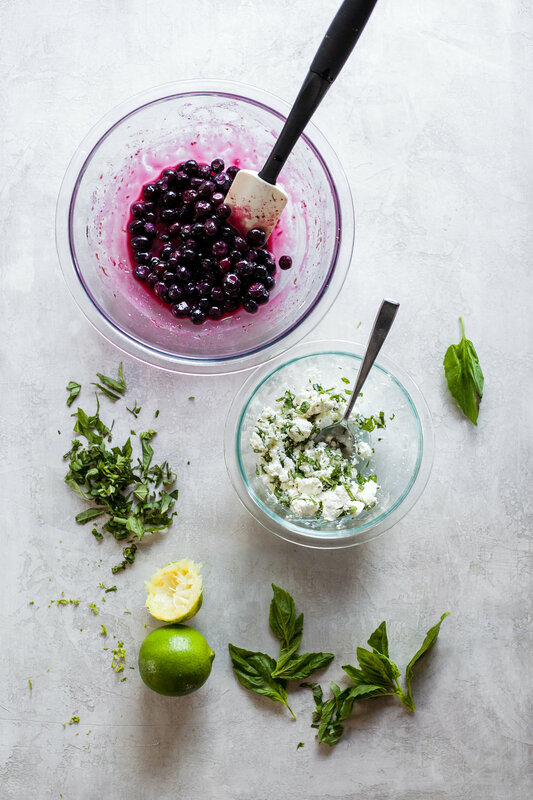 In another small bowl, mix together the softened goat cheese and chopped fresh basil. Preheat the oven to 400 degrees F and prepare a baking sheet with a piece of parchment. 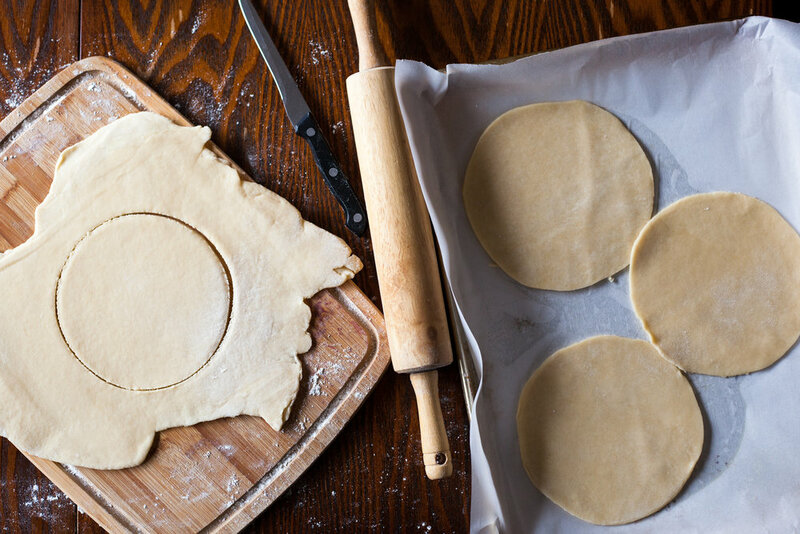 Roll out the pie crust on a well floured surface until it is 1/8 inch thick. I used the back of a plate to make 6 inch circles in the dough, and then cut out the circles with a knife. Re-roll out the dough scraps to make as many 6 inch rounds as you can. I made a few mini 3” ones with the final scraps. 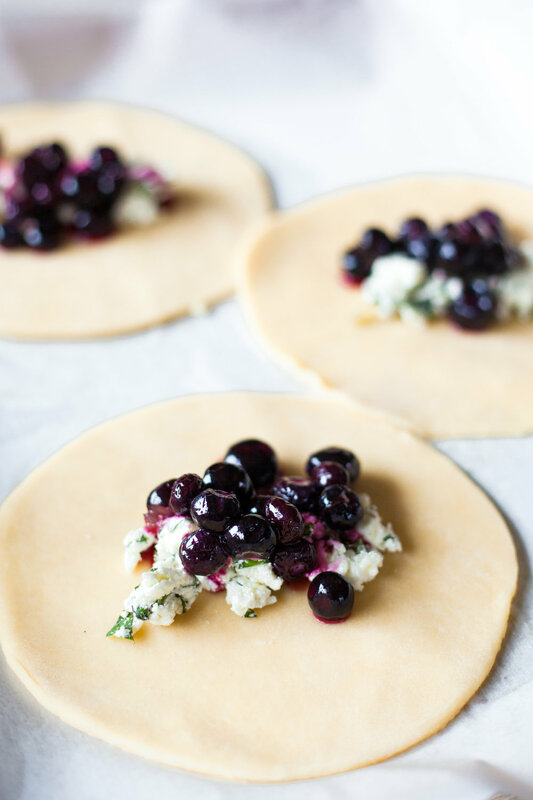 In a small bowl, combine the egg and water to make the egg wash.
Place about 1 TB of the goat cheese basil mixture in the center of the pie dough, and cover with a scoop of the blueberry mixture. You can practice folding the dough over to see how much fruit you can actually fit in there. Keep at least a half an inch border around the edges. Brush the half inch edge all the way around with the egg wash, and fold the dough over to create a half circle and enclose. Press the edges down firmly with your fingers, then crimp with the tongs of a fork to seal. Repeat these steps with all the pie dough rounds. Transfer the pies to the prepared baking sheet as you go. Brush the top of the pie with the egg wash and sprinkle raw or coarse sugar all over. Cut a few 1/2 inch vents in the top of the pies. Bake 25-30 minutes (mine came out at 29 minutes) until golden like a croissant and the fruit juices are bubbling out. Let them continue to cook on the hot pan a few minutes before serving. Store in a covered or airtight container for up to 3 days. Reheat in the toaster oven if desired!